YouTubers involve in the heated discussion the moment the video named Ghost Towns cropped up on YouTube offering up to 4320P 8K resolution. Some watchers fail to play this 8K video for the internet or hardware are not so improved to make 8K video run smoothly on computer, while some others point out 8K resolution is quite meaningless when most people run 1080P displays. Despite of the view "almost no one can watch 8K video", we believe that more and more equipments with 8K display will come out soon granting us epic visual effect. Well, if you want to play a video in 8K on various devices, one thing you need to know is 8K video format. Grab the fastest 8K video converter - WinX HD Video Converter Deluxe to convert/compress 8K video to 1080P/720P/360P in H.264, MP4, AVI, WMV etc, with crisp images/hi-fi audios for play any 8K videos on PC/Mac and portable devices with non-8K display in a smoother way. Like H.264, M2TS which are widely used for high definition (1080P) videos, is there some special format for 8K video? Successor to H.264, HEVC (High Efficiency Video Coding) is firstly approved as video compression standard on April 13, 2013. According to developer Moving Picture Experts Group (MPEG), HEVC delivers data compression ratio twice over H.264 leading to an optimized quality at the same bit rate of a video, which makes a reality to support 8K FUHD with a resolution of 8192x4320. Thanks to high coding efficiency and a wide range of extensions profiles, as MV-HEVC (multi-view extensions), 3D-HEVC for more types of videos, this 8K video format is expected to be mainstream video format for network and high resolution displays. The other video format that supports 8K resolution is VP9 (WebM), which is royalty-free format frequently used for HTML5 video and supported by YouTube, Chrome, Firefox and Opera. VP9 boasts high compression efficiency (50% bit rate of VP8 video at the same level of quality) and is greatly improved to output higher definition videos up to 4320P. Comparing the two 8K video formats, H.265 seemingly offers better performance, but VP9 does well job on video streaming. How to Play 8K Video on PC/Mac/Devices Smoothly? Since barely devices can support 8K video format (HEVC or VP9), you may need an 8K video converter to convert/compress 8K video for playback on your PC/Mac, smartphones or tablets without hassle. WinX HD Video Converter Deluxe is the top-notch video converter capable of converting any 8K/4K/HD videos (HEVC/VP9/H264/MKV/M2TS) to MP4, AVI, WMV, MOV, FLV etc, up to 83x real-time conversion speed and delivering hi-fi images/audios. Featuring a online video downloader, it empowers users to download 8K/4K/HD or 3D movies from YouTube, Dailymotion, Vimeo, Metacafe, and alike video site and convert them to iPhone, iPad, Android, Windows Phone (10/8), Xbox, PS3/4, Surface Pro and more popular devices with no effort at all. >> How to Convert 8K/4320P UHD Videos to 1080P on PC or Mac? This 8K resolution video converter is fully compatible with Windows 10, 8.1, 8, 7 and lower version. 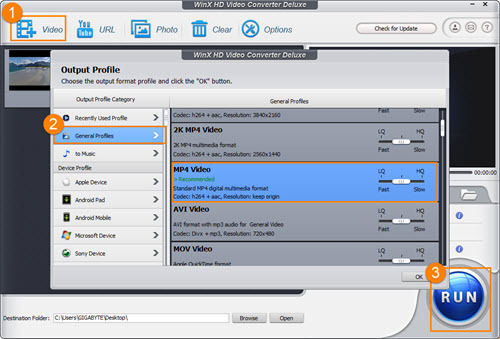 For converting/compressiong 8K videos on Mac, please turn to WinX HD Video Converter for Mac. ▪ Download 8K/4K/HD/SD/3D videos from up to 300 online video-sharing sites in a flash. ▪ Convert 8K/4K/HD/SD videos to MP4, AVI, WMV, MOV, iPhone 6/6 Plus, iPad Air 2/Mini 3, Samsung Galaxy, HTC One, Sony Xperia, Windows Phone/Tablet, Xbox, PS3/4, Apple TV, Android TV with possible highest video/audio quality.